The oldest of the cameras in my new collection is the Kodak 1A Autographic. 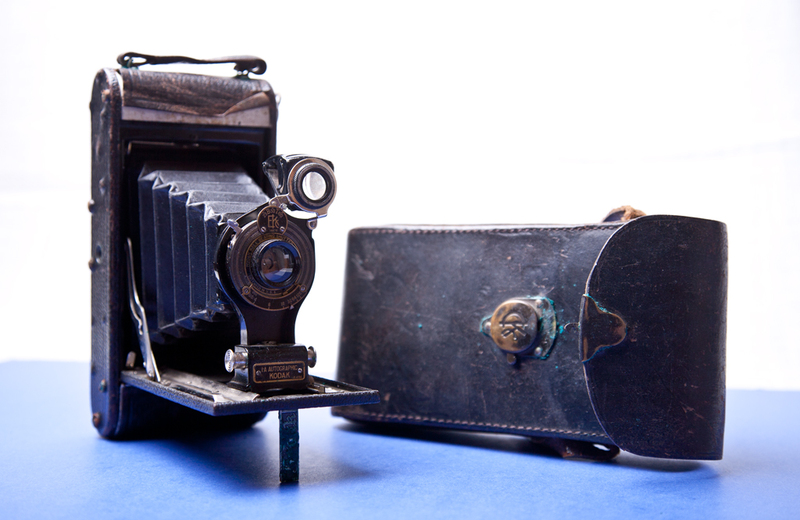 It takes 116 film and according the Kodak web site was made between 1917 and 1924 with an original list price of $21. The aperture is marked in the old Uniform System to indicate the diaphragm opening. It's marked 4 to 128 which, according to a table I found on Wikipedia, corresponds to f/8 to f/45.2. The shutter has five speed settings: 25, B, 50, T and 100. Based on sound, I think 25, 50 and 100 are 1/25th, 1/50th and 1/100th of a second. B, which I assume stands for Bulb, keeps the shutter open for as long as the shutter release is held down. T, which I assume stands for Timed, opens the shutter on the first shutter release press and closes it when the shutter release is pressed a second time. The view finder consists of two lens 90 degrees to each other with a 45 degree mirror reflecting the image from the front one into the top one. You look down into the top one to frame your image; basically a rudimentary twin-lens reflex. The assembly rotates 90 degrees for either landscape or portrait mode. Probably the most unique thing about this camera is in the back. It has a little metal window that opens up. The camera takes A116 film. This is normal 116 film with a sheet of tissue paper rolled up with it. The idea is you can open the window and write on the tissue paper for each exposure. Who knew there was keyword tagging for your photos at the beginning of the last century? The introduction has an index of all the cameras in this series.